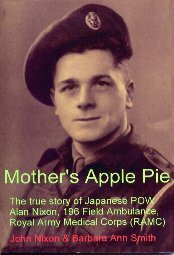 This book relates the true and moving account of Alan Nixon's life as a member of the Royal Army Medical Corps in Chungkai, Japanese POW camp, Thailand. Based on a diary he hid from his captors, the factors that threatened his survival are explored and described. These include disease, diet, physical threats from the Japanese, positive and negative psychological influences and the lighter, life-enriching aspects of being a Japanese POW. A major factor he attributed to his survival was the good upbringing he had in Yorkshire, and in particular the role his mother, Gertrude, played both before and during his ordeal. Part of any profits made on this book will be donated to the FEPOW Building at the National Memorial Arboretum.